Come along and hear stories of how God has been at work significantly growing his church through the ministry of his word in the language people understand best. 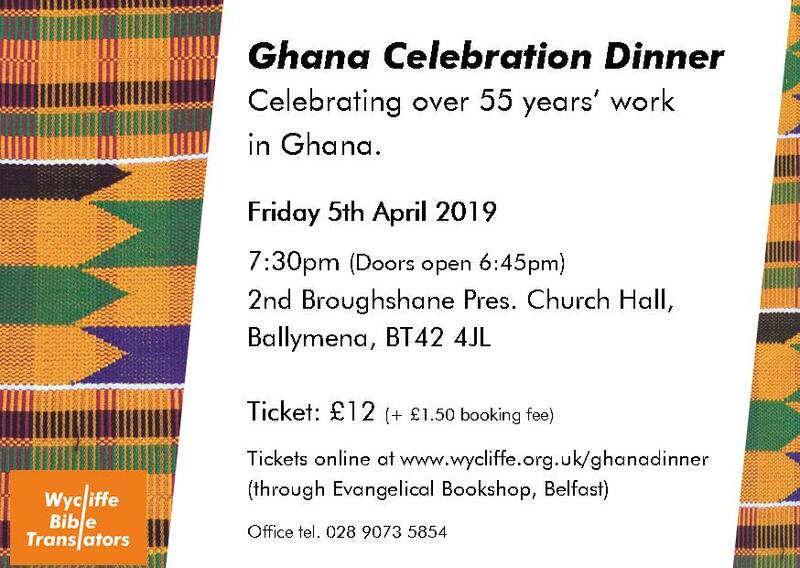 We will honour those God has used from Northern Ireland who have gone to serve in Ghana such as Ian and Claire Gray, Mary Steele and Bob and Joan Duff. “We will also recognise the great number of churches and individuals who have faithfully supported the work in Ghana. This is an event where you will be encouraged about how God has been at work and how we can continue to be involved in what he is doing through his frontline mission of Bible translation. Tickets for the evening will cost £12 (+ £1.50 booking fee). You can purchase your tickets online here. Find out more about Wycliffe Bible Translators on their website here.